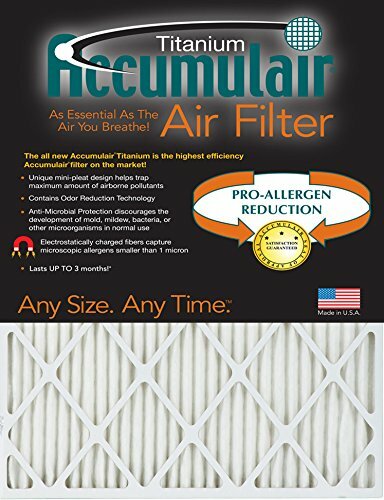 The all-new Accumulair titanium is the highest efficiency Accumulair filter on the market the electrostatically-charged fibers capture microscopic allergens smaller than 1 micron the unique mini-pleat design helps trap maximum amount of airborne pollutants. It discourages the development of mold, mildew, bacteria or other microorganisms in normal use. No chemicals are added to Accumulair can last up to 3 months filter measures 15x30x1 (14.5 x 29.5 x 0.75).